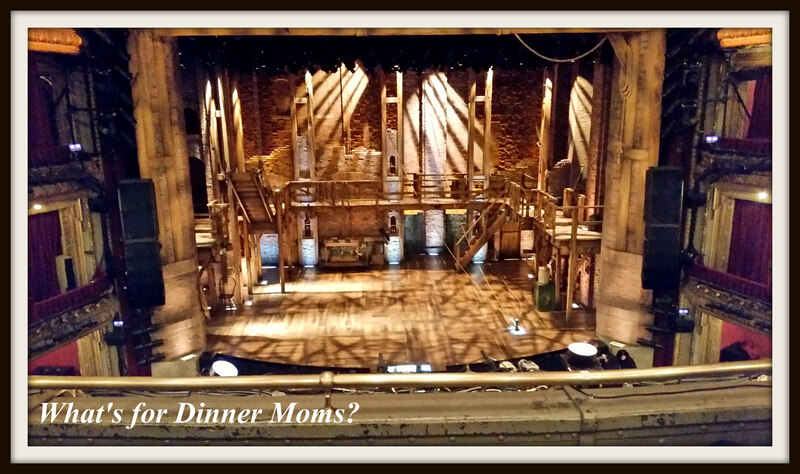 Hamilton in Chicago – What's for Dinner Moms? 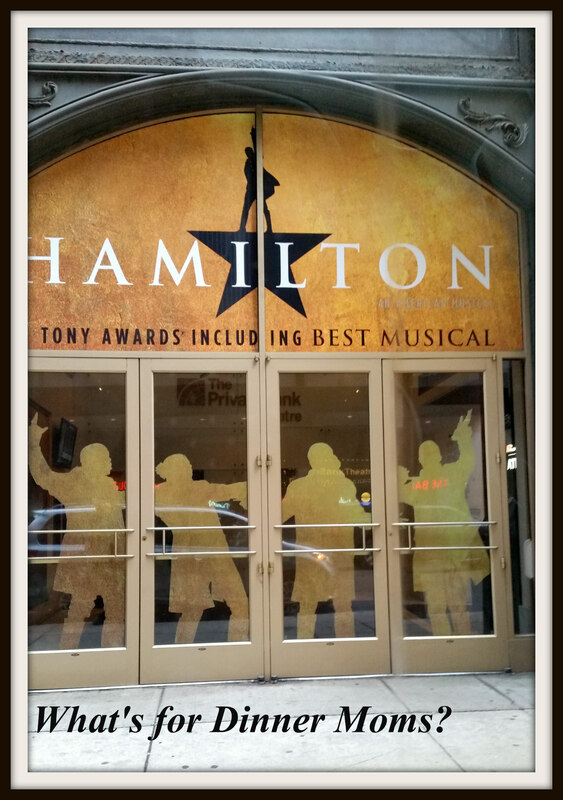 Seven months ago we bought tickets for “Hamilton” in Chicago. It was the kids main Christmas present. They love the music and got us hooked too. So, for the last seven months we have been listening to the sound track and reading all we could about the musical. The day was finally here to see the show. We decided to head into Chicago a bit early as even though we are only 90 miles a way it can take 90 minutes or 3 hours to get into the city. One bad accident or construction and you can be sitting in gridlock for what seems like forever. Today was one of those days we sailed right through. We booked a hotel room at the Hampton Inn right over the Majestic Theater so we got parking after 8:30 am. We were able to use valet parking and check our bags so we could go get lunch before the matinée. Right around the theater there were plenty of places to grab lunch. We were able to head into the theater at 12:45 pm for the 1:30 pm matinée. We were seated in the third row of the Mezzanine with suite service. Which means before the show we had access to hors d’oeuvre, bar, coat check and bathrooms. It was well worth the service just to have coat check and drinks before the show and during intermission. This was our view of the stage from our seats. It was amazing. The set was simple but they used the ensemble to fill it up, make it intricate, and very interesting visually. 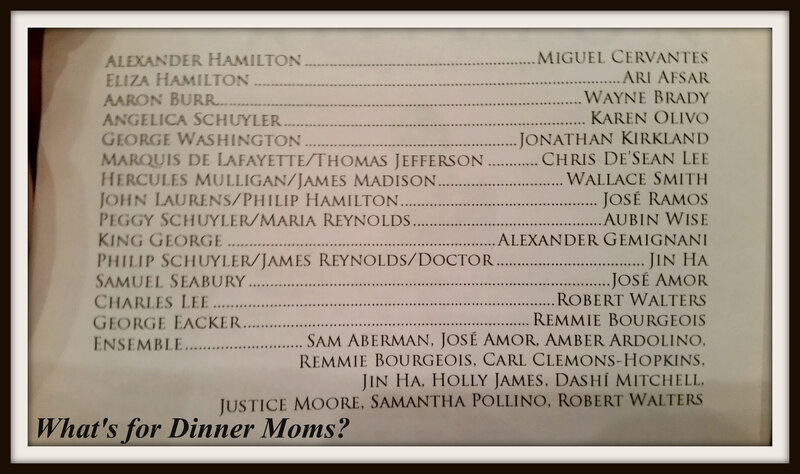 We were fortunate to see Wayne Brady as Aaron Burr. We weren’t sure if he would perform or not as we were seeing a matinée. I love Wayne Brady on “Whose Line is it Anyways?” But, I had reservations about seeing him in a serious role. I read his biography about all the theater he has done but I wanted to see it for myself. I was so glad we got to see it. There were a few spots he was still obviously growing and getting comfortable in the role but for the most part it was outstanding! Seeing the show is so very different from listening to the cast recording. Some things that aren’t very clear on the cast recording such as “Satisfied” and “Hopeless” are looking at the same period of time except from two different perspectives. At the beginning of “Satisfied” the previous scene goes in reverse to show it again from the second perspective. It all made sense in the music now. My favorite performance by far was King George III. In my opinion he was even better than Jonathan Groff (Jesse St. James – Glee and Kristoff – Frozen) in the original cast recording. His comedic timing was impeccable and his choices to play to the audience made every time he appeared on stage magical. The best surprise of the show was his appearance in “The Reynolds Pamphlet.” His obvious glee over Hamilton’s shame was hysterical. During the show there was plenty of laughs, tears, and audience response to certain lines that resonated with the situation of our country today. Given the chance I would definitely see this show again. There was so much visually to watch, especially during the ensemble numbers, that I would want to see it again to follow the things I missed the first time. IF you love the music I would say it is well worth seeing the show. Tickets are on sale for now through September 2017. There is a good chance of the run being extended at least into 2018. As an added bonus staying at the Hampton Inn over the Majestic theater we happened to see Chris D’Sean Lee (Lafayette/Thomas Jefferson) in the lobby of the hotel after the show. He was so cute. If you happened to see him on the street you probably would walk right by him but on stage he was dynamic. Thank you. It was a great day and one my children will hopefully remember for a long time. Thank you. I feel very fortunate that I was able to share this with my family. I haven’t seen a musical in almost 10 years! What a wonderful Christmas present for the family! Thank you! This was the Christmas of experiences more than gifts. Before I know it they will be grown. Sounds like a wonderful show. We are taking our boys to a theatre show at Easter. It is such a great thing to do as a family. Thank you. It was fun and a great thing to do as a family. For Christmas this year we gave 4 sets of tickets to events instead of regular gifts. This is the year of experiences for our family. It sounds wonderful! I am jealous though. Hamilton isn’t coming to Houston until 2018! Glad you were able to enjoy it with your family. Thank you. Go see it if you get the chance and like the music. It truly was an special time. Wow, Wayne Brady was in it?! I wanted to see it when Lin Miranda was in it but who could afford the price. Glad you and your family got to see it! Yes! He started just a few days before we went and is in it through mid-April. We got tickets right from Ticketmaster on opening day. No buying marked up tickets for me.